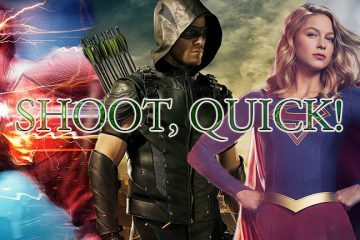 The Flash brings back some more focus on Caitlin/Killer Frost this week. It also introduces us some more to Savitar and reveals who Alchemy is. 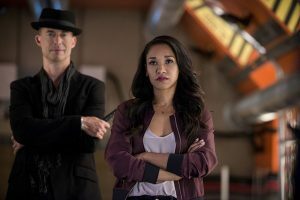 The episode opens right where it left off and Savitar takes The Flash on a little trip. Cisco and Caitlin show up to save him and the episode starts to go downhill from there. Caitlin sneaks into an interrogation room to threaten a suspect, abducts Julian, and attacks Barry. It’s definitely not the best episode, but it has some good moments. Iris and Barry scenes are the best part of this episode. Sure, they might be a little cheesy, but they work. Iris still isn’t getting quite the attention she deserves, though. Her and Barry have a bit of a heart to heart and he reiterates that he can’t be The Flash without her. Then when Barry quits his job later in the episode, Iris and Joe both jump to his defense before he says why he quit. Danielle Panabaker does a much better job of being Caitlin Snow rather than Killer Frost. It was fine when she was the Killer Frost on Earth–2, but here it just feels off. In the end, it looks promising that she continues to stay grounded after Barry’s speech to her. However, while she’s Killer Frost, she blurts out to Cisco and the team that Dante was alive and well in the other timeline. This doesn’t do any favors for Cisco and Barry’s relationship, which already isn’t nearly as strong as it is in the other timeline. This episode is a huge blow to the team dynamic for a bit. It looks as if they’ll be able to move forward, but who knows anything for sure. It’s a bit disappointing that they’re focusing on yet another speedster, too. But let’s focus on Wally for a second. He’s a bright spot in the show once Caitlin finds her way back and gives Barry a serum to help Wally out of his fugue state. Joe cut him out of the cocoon he’s in and that’s how we end up there. Once Wally is functioning normally again, he’s ecstatic that he has his powers. At the end of the episode, it closes out with the reveal that Julian is Alchemy. It didn’t feel like a big surprise, mainly because it’s always felt like there was an alternate reason to Julian suddenly showing up in this timeline without any other real character additions. While it’s predictable, it’ll be interesting to see how it plays out, especially with Barry no longer around him at the CCPD. Iris still needs more to do other than be Barry’s girlfriend, Wally’s sister, and Joe’s daughter. How long will they play out the will she or won’t she with Caitlin/Killer Frost? HR didn’t have a huge presence this week.